Port Blair, Jan 19: In a very swift and well coordinated operation, Coast Guard successfully apprehended the 12 Myanmar poachers on 17 Jan 15 who were illegally exploiting the marine resources of the Pristine islands. Indian Coast Guard Dornier Aircraft, whilst on surveillance in Southern Group of Islands, sighted a single fishing boat operating 70 km off Tillangchong Island at around 1200 hr on 17 Jan 15. The 30 ft size boat had radar, large number of crew and had no name on it. The aircraft attempted to establish communication with the boat for identification but the boat crew did not respond and started fleeing in an evasive manner. On receipt of information, Coast Guard Regional Headquarters Operation Centre directed Dornier aircraft to maintain in area and diverted Coast Guard Ship Samar for investigation of the suspicious boat. The Coast Guard Ship Samar intercepted and apprehended the Myanmar boat at 2025 Hr around 145 km from Tillangchong Island after a chase of eight hours. The boat was equipped with high tech equipment like radar, GPS, Echo Sounder, Diving equipment and had adequate ration to survive for more than 01 month. 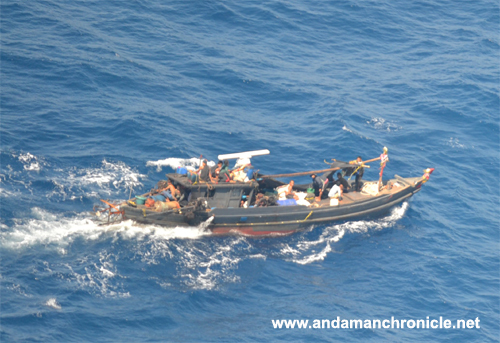 The apprehended Myanmari boat alongwith 12 poachers were taken under tow by Coast Guard ship Samar which entered Port Blair at 0930 hr on 19 Jan 15. The apprehended boat and crew were handed over to police for subsequent formalities and joint interrogation. Coast Guard is committed to prevent any illegal exploitation of our rich marine reserves and ships and aircraft are vigilant to apprehend poachers within the Maritime Zones of India. Since 2014, a total of 04 foreign boats with 37 poachers have been apprehended by Coast Guard in A&N waters. It also needs a special mention that due to the concerted efforts of Indian Coast Guard in coordination with other agencies, the poaching has drastically reduced in last few years in Andaman & Nicobar Islands.